The second half of 2018 was a rough stretch for Canadian manufacturing. After a strong start to the year, monthly output peaked at $58.5 billion in July and then began to decline steadily. Sales fell in four of the next five months, bottoming out at $56.5 billion in December. However, stability in petroleum refining and a jump in food processing output helped the manufacturing sector start 2019 off on the right foot; manufacturers posted their first monthly increase in production since September. All told, manufacturing sales rose by 1.0 per cent in January, bringing total sales back up to $57.1 billion. Although that increase was enough to gain back December’s losses, overall manufacturing output remains 2.5 per cent below its July peak. January’s increase was driven by a recovery in output volumes. Volume-based sales were up a healthy 1.4 per cent compared to December – their fastest month-over-month increase since last February. 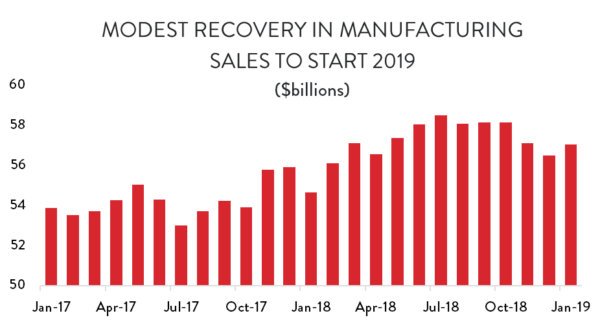 Since price-adjusted sales exceeded nominal sales, that suggests that manufacturers were, on the whole, selling into a deteriorating price environment in January. Volume-based sales gains were relatively widespread. Output volumes stabilized in petroleum refining and chemicals production, while most other sub-sectors posted strong increases. The only significant weak spots were in paper production and in the aerospace sector, where the timing of aircraft deliveries regularly causes dramatic fluctuations in monthly output levels. There was also a modest recovery in forward-looking manufacturing indicators in January. New, non-aerospace, manufacturing orders had been trending downward since July as demand for goods waned and the Canadian economy slowed. However, demand picked back up again in January, as new (non-aerospace) orders rose by 1.2 per cent compared to December. 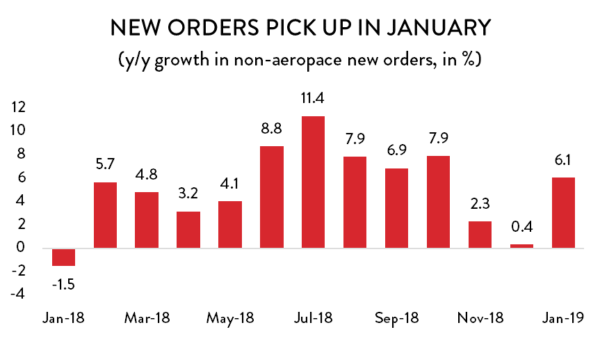 As for the aerospace sector itself, December’s figures were revised to include a massive $8.8 billion spike in new orders. There were no new orders to speak of in January, but those kinds of spikes are typical for a sector where it takes a long time to produce a final good. Rising new orders meant that the backlog of unfinished work in manufacturing went up as well. Unfilled orders (not including aerospace) rose by 0.4 per cent in January to reach $43.8 billion. 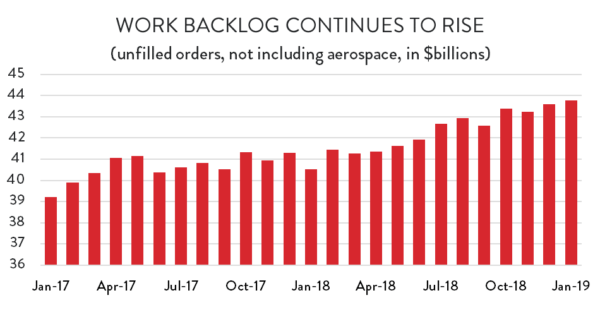 Manufacturers have not had this large a backlog of work orders since early 2015. At the industry level, most of the output gains in January were on the durable goods side. The one notable exception was in food processing, where output levels jumped by 2.8 per cent ($240 million) compared to December to reach their highest level in nearly a year. Sales of motor vehicles and parts were up by 1.5 per cent ($125 million) – their first month-over-month increase since October. There were also strong increases in sales of wood products, fabricated metals and machinery. 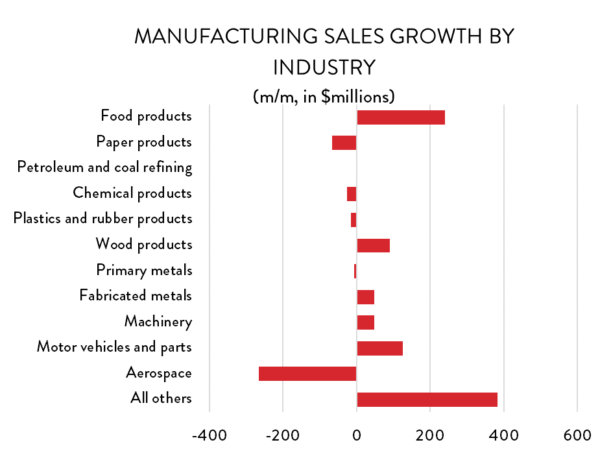 Several of Canada’s smaller manufacturing sub-sectors also posted solid gains to start the year. Leading the way were producers of electrical equipment, appliances and related components who saw output spike by nearly 13 per cent to cross over the $1.0 billion threshold for the first time in nearly 18 years. There were also solid increases in the shipbuilding, non-metallic minerals, printing, and furniture industries. On the negative side, there was a sharp decline in aerospace deliveries in January. November and December had been unusually good months for the aerospace sector (in terms of the timing of deliveries). However, sales fell back by 12.4 per cent ($266 million) in January to return to about October’s levels. Elsewhere, most output declines were relatively small, with two exceptions: sales of paper products continued to trend downward, with output falling by 2.7 per cent in January; and rail car production dropped significantly after two strong months to end 2018. Finally, output in petroleum refining stabilized in January after dragging the entire manufacturing sector down in the previous two months. Refinery output was effectively unchanged compared to December. It remains more than 23 per cent below October levels, but the bleeding appears to have stopped for now. 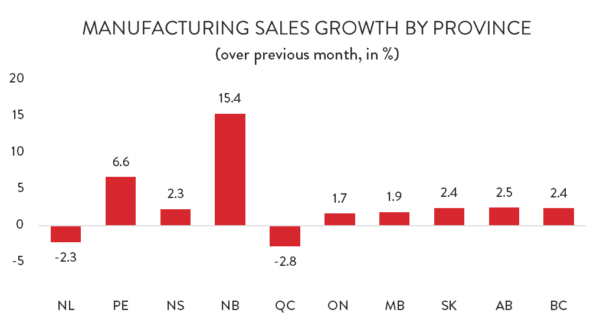 Looking across the country, January was a solid month for manufacturers in most provinces – only Quebec and Newfoundland and Labrador saw output levels decline compared to December. However, in Quebec that drop was precipitous. Owing to the large decline in aerospace deliveries, manufacturing sales in that province were down 2.8 per cent ($398 million), falling to their lowest level since May. Meanwhile, manufacturing output in Newfoundland was down 2.3 per cent. After spiking to nearly $700 million in October, sales in that province have fallen by nearly 28 per cent. Elsewhere, the news was good. On a dollar-value basis, the largest increase was in Ontario, where manufacturing sales were up by $438 million (1.7 per cent), gaining back most of the losses from the previous two months. There were also strong gains across western Canada in January as all four provinces gained back a portion of their recent output losses. In New Brunswick, sales spiked by more than 15 per cent as refinery output returned to more normal levels. Finally, little PEI continues to set the pace for the rest of the country in terms of overall sales growth. Although total output levels are much smaller than they are elsewhere, they are increasing at an explosive pace. Output rose by 6.6 per cent in January and is more than 46 per cent higher than it was 12 months earlier.